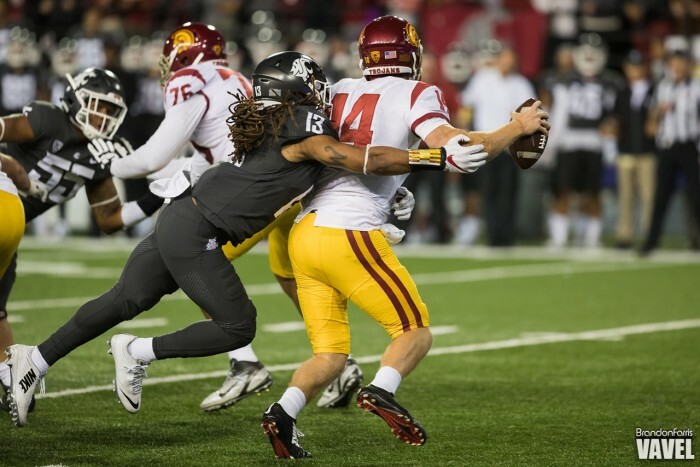 Sam Darnold and the USC Trojans fell to a 30-27 loss on Friday night against the Washington State Cougars. If the season were to end now, you’d be hard pressed to find many people who would not be forecasting a repeat of the 2015 and 2016 National Championship games between Alabama and Clemson. A hat-trick of title games between these two side’s look even more likely after a week five slate which saw the Pac-12 favourites suffer their first loss and LSU suffered a stunning upset at home to the Troy Trojans of the Sun Belt conference. Meanwhile, a Stanford running-back not named Christian McCaffrey is garnering Heisman buzz, and Jimbo Fisher’s Florida State finally have a win under their belts on the last day of September. 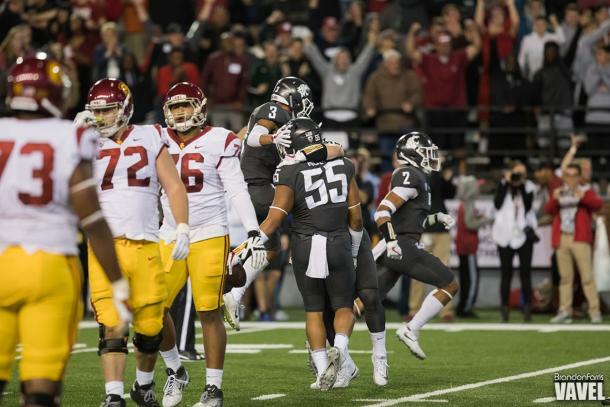 In what was always seen as one of their toughest games on the schedule, USC’s National Championship hopes took a massive hit after they fell to a 30-27 defeat against Washington State at Martin Stadium in Pullman. On a wild Friday night, two vital turnovers from Sam Darnold cost the Trojans their perfect start to the season, while Wazzu quarterback Luke Falk threw for 340 yards and two touchdowns as Mike Leach’s side moved to 5-0 following five home games to start the season. 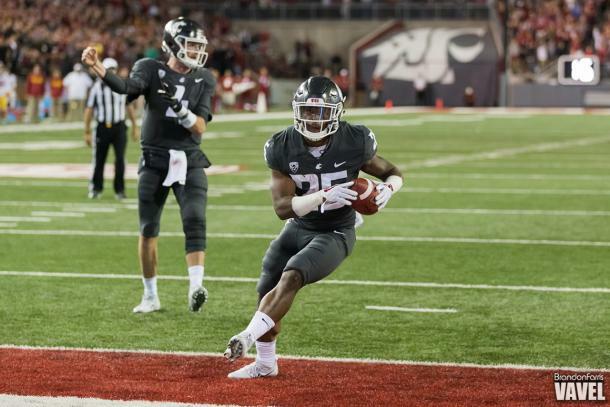 With the game tied at 20-20 in the fourth quarter, Jamal Morrow took a 23 yard pitch from Falk to the house as Wazzu went ahead, before Darnold and USC answered with a touchdown of their own following a 12-play 75 yard drive. Morrow then scooted for another big run to put the Cougars in field-goal range and Erik Powell converted from 32 yards out to move three points ahead with 100 seconds left on the clock. 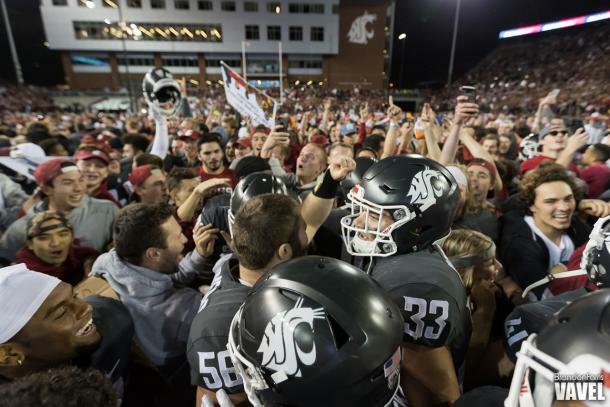 Needing to drive the length of the field, Darnold took a sack and fumbled on 2nd and 10, with Cougar linebacker Derek Moore scooping up the loose ball to end Washington State’s 15-game losing streak at home to ranked opponents. Elsewhere in the weeknight games, #14 Miami remain unbeaten after impressive 31-6 Friday night win at previously unbeaten Duke and Texas knocked off Iowa State on Thursday evening. The top two ranked side’s in the nation passed significant tests on Saturday, although not both were tests of the same nature. 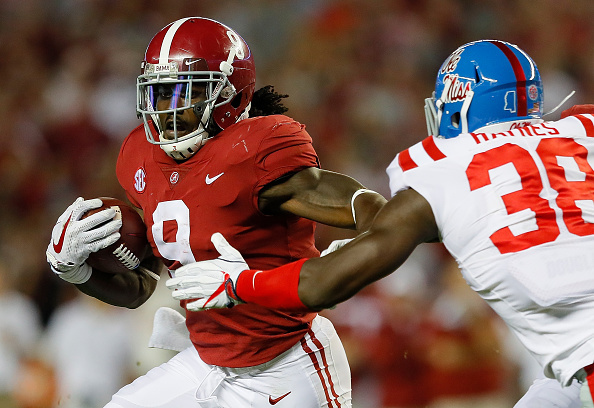 In Tuscaloosa, Alabama throttled their SEC rivals Ole Miss in a 66-3 win at Bryant-Denny Stadium that has earmarked their defence as one of potential greatness once more. The Rebels had scored 43 points in both of these team’s previous clashes, but on Saturday evening they could only muster three first-quarter points in a horrific beat down. Jordan Wilkins had a fair amount of success on the ground, averaging 8.4 yards over his 12 rushes, but the passing game just didn’t get off the ground with Shea Patterson successful on less than half of his passes, and actually completing more touchdown throws to the Alabama defence. Levi Wallace’s pick-six early in the game set the tone and with the offence looking at their efficient best, a 35-3 half-time lead was never under threat for the romping Tide. In a much stiffer challenge, Clemson’s success on the road extended to one of the toughest atmosphere’s in the country as they knocked off the Virginia Tech Hokies 31-17 in Blacksburg. Very similarly to Bama, Clemson had practically closed out this win by half-time after a pair of touchdowns from Tavien Feaster and C.J. Fuller giving them a two-score lead at the break which they didn’t come close to relinquishing thanks to a swarming defensive effort. Elsewhere in the top ten, Penn State extended their winning start to 2017, after Trace McSorley threw for 315 yards and a pair of touchdowns in their 45-14 win at home to the Indiana Hoosiers. Saquon Barkley continued his mesmeric start to the start, posting 56 yards on the ground, 51 through the air, and also completing a touchdown pass to DaeSean Hamilton late in the piece. Oh, and Barkley also started the game with a 98-yard touchdown return on the opening kickoff. The sixth ranked Washington Huskies also remain perfect on the season after Dante Pettis scored three touchdowns in their 42-7 win against Oregon State, while #10 Wisconsin battled back from a halftime deficit to hold off Northwestern in a 33-24 victory at Camp Randall Stadium. Everyone has now heard of Bryce Love. 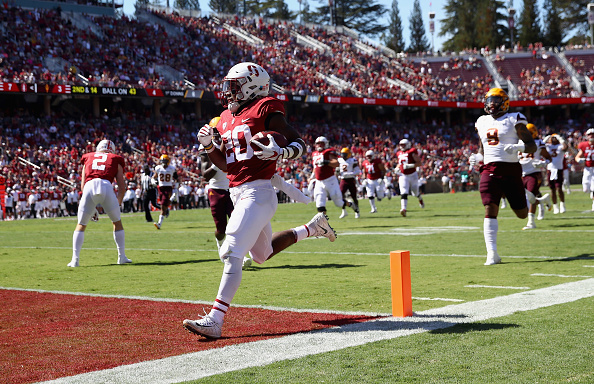 Entering week five, Love had 787 from 73 carries and just 14 carries into Stanford's clash with Arizona State he reached 1,000 rushing yards for the season. Taking over from the now departed Christian McCaffrey, the Cardinal aren't missing a beat in the backfield and in this 34-24 win over Arizona State saw him carry the ball 25 times for 301 yards and three scores. His rushing yardage totals so far this season read; 180 vs Rice, 160 vs USC, 184 vs San Diego State, 263 vs UCLA and now 301 vs Arizona State and Love is making it impossible to leave him out of the Heisman debate despite his side's underwhelming 3-2 start to the season. Outside of Alabama, the SEC has come under weighty criticism over recent years, but in 2017 there are a pair of teams who look capable of causing unrest at the top table. The 7th ranked Georgia Bulldogs did what all favourites should and handed the struggling Tennessee Volunteers a 41-0 hiding at Neyland Stadium in Knoxville. In what was a complete mismatch from the moment Quinten Dormady was picked off with the Vols first play from scrimmage, the Bulldogs manhandled their opponents behind another three-figure rushing day for Nick Chubb. Auburn are another who look to be hitting their straps at the right time after they eased to a 49-10 win over Mississippi State at Jordan-Hare Stadium. Jarrett Stidham completed 13 of 16 passes for 264 yards and two touchdowns in a highly-encouraging performance, while his compatriot Nick Fitzgerald threw two picks as part of his tough day where he was successful on the same amount of passes as Stidham, but had to throw 17 more times to do so. Kerryon Johnson rumbled for 116 yards and three touchdowns from his 23 carries, and the Auburn receivers averaged 19.1 yards a catch through the air on a dominant day for the Tigers. The other Tigers in the SEC suffered the most stunning loss of the season to date, with LSU falling 24-21 to Troy at Death Valley. 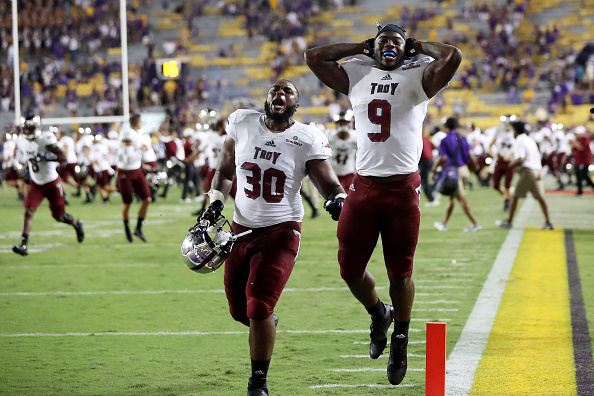 Jordan Chunn rushed for 191 yards and a score and the defence forced four turnovers as the Trojans upset LSU who suffered their first ever loss to a Sun-Belt opponent. Texas A&M moved to 2-0 in SEC play this year after edging to a 24-17 win over South Carolina, and in the Swamp, Malik Davis rushed for 124 yards and two TD’s in Florida’s 38-24 victory at home to Vanderbilt. A touchdown with 53 seconds left on the clock from Auden Tate led the Florida State Seminoles to their first win of the season, after they overcame Wake Forest 26-19 in Winston-Salem. Following losses to Alabama and NC State, pressure was starting to mount on Jimbo Fisher's squad, but they managed to pull through in a tough spot with freshman QB James Blackman hitting Tate with a beautiful pass to complete the win after they trailed the Demon Deacons for much of the second-half. 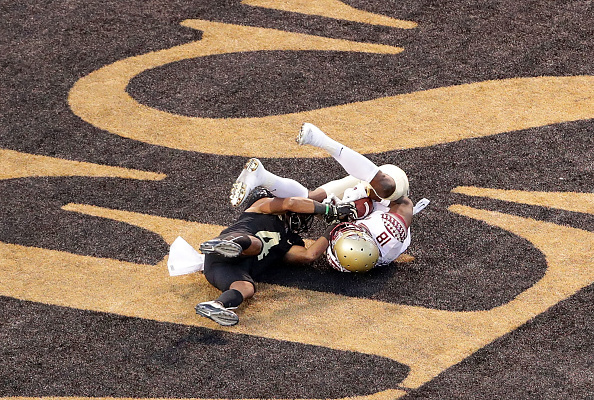 Wake Forest actually had a chance to tie the game up in the final seconds but Derwin James had other ideas, breaking up a pass in the endzone as time expired. Playing against the Murray State Racers from the Ohio Valley Conference, Lamar Jackson passed for 249 yards and three touchdowns, while adding 100 yards and a TD on the ground as Louisville eased to a 55-10 victory. In a quiet week for Big 12 play, the Oklahoma State Cowboys rebounded from last week’s home loss to TCU with a 41-34 win over Texas Tech. The Red Raiders were level going into the final two minutes, before Mason Rudolph ran for a 16-yard touchdown on another big number night for the Pokes signal caller who amassed over 400 yards of total offence while accounting for five touchdowns.